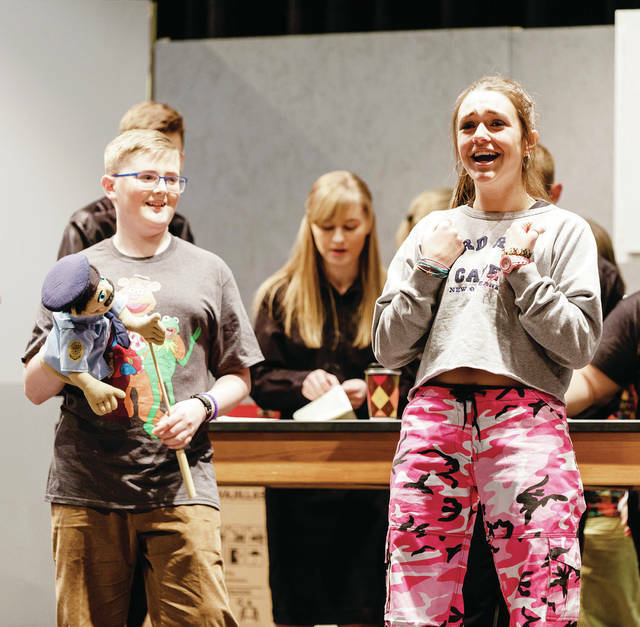 Sydney Schauwecker rehearses with cast members for the stage production of “Freaky Friday,” to be presented this weekend at Delta High School. They bicker and fight and just don’t see eye to eye. So when a bit of magic switches them to each other’s bodies, chaos ensues. 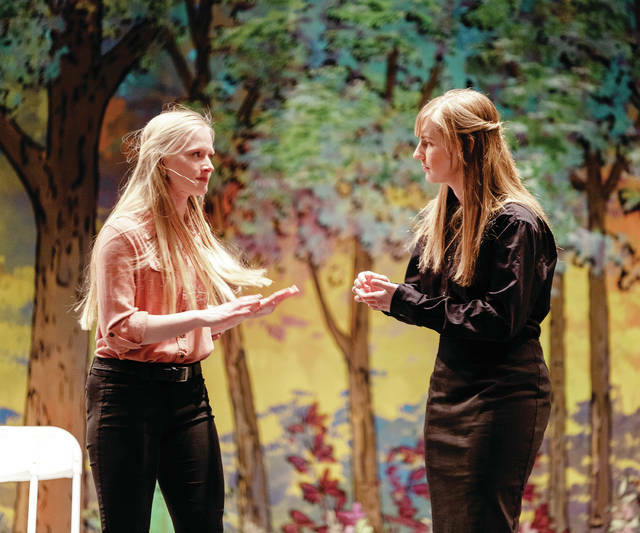 “Freaky Friday,” the musical version of a novel turned hit movie, will take the stage at the Delta High School auditorium this weekend, and co-director Dee Dixon said it’s a guaranteed two hours of fun. “We liked the idea that it was a brand new show, and something that hasn’t been done in this community. It was the idea that we were trying to do something fresh and new,” she said. Showtimes are Friday, April 5, and Saturday, April 6, at 7:30 p.m., and Sunday, April 7, at 2 p.m.
Tickets are $9, or $14 for the fast-selling gold star ticket that reserves a front-row seat. The high school box office at 605 Taylor St. will be open 5:30-7:30 p.m. Thursday, and tickets will be available at the door one hour prior to each performance. The approximately two-hour musical follows widow Katherine Blake, a caterer, and her teenage daughter, Ellie. Sparks fly continually in their tempestuous relationship, moreso because Katherine is remarrying and Ellie doesn’t approve. On the day before the wedding, which Katherine is overseeing exclusively and which is potentially the subject of a magazine story, the two unwillingly switch bodies through the power of a magic hourglass. The hourglass, one of two gifted by Ellie’s late father, breaks. Now the mother and daughter must contend with each other’s lives and problems while scrambling to find the other hourglass – which Katherine had sold – before the next day’s nuptials. Based on a 1972 novel by Mary Rodgers, the 1976 Disney movie version starring Barbara Harris and 14-year-old Jodie Foster was remade into a 2003 film starring Jamie Lee Curtis and Lindsay Lohan. Disney’s musical adaptation debuted in October of 2016, and a one-act version was shown on the Disney Channel in 2018. And sophomore cast member Dakota Swicegood is also the musical’s choreographer. Dakota dances and teaches dance at Stars Unlimited Dance and Baton Studio in Wauseon. Dixon, who directed plays at Tinora High School for 10 years, and directed “Annie” at DHS, said Sydney came to auditions ready to earn a “Freaky Friday” role. A veteran of 36 productions between high school and community theater, Sydney starred in “Bus Stop” in January at the Toledo Repertoire Theatre. Her role in “Freaky Friday” has proven to be one of her most difficult, “and I’ve done Shakespeare,” she said with a laugh. What’s most difficult about playing Ellie is that she and Ashley must remain perfectly in sync with their characters throughout the show or it’s not believable, Sydney said. Sydney plans to study orthodontia in college, but said she’ll minor in theater. “I plan to do this the rest of my life. It brings me the most joy of anything, especially with my best friend,” she said. Dixon said Ashley’s portrayal of Ellie “was exactly what I was looking for,” and so fit perfectly for her role as Katherine, since Katherine essentially becomes Ellie for much of the musical. A veteran of four DHS productions, Ashley said the fun of playing Katherine comes, in part, from sharing the stage with Sydney. “And I get to have a wedding on stage, so that’s pretty cool,” she said. A dancer the past 10 years, Ashley plans to study business in college and eventually open her own dance studio. But she wouldn’t say no to more acting, and wants to pursue community theater. Some of the language and thematic elements of the “Freaky Friday” stage production have been toned down to make the show more family-friendly, Dixon said. However, audiences won’t be disappointed. “People are familiar with the story. We thought it would be a cool opportunity to bring something into our community that kids would want to be at and enjoy,” she said.